Each mat measures 24" or 40" x 75"
Thera Band Exercise Mats are high density, lightweight supports used to provide comfort, safety and protection against injury. 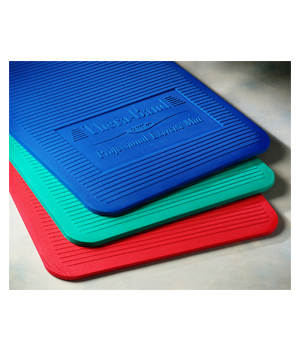 The professional club quality mats have a fabric-like surface that is waterproof, wear resistant and designed for the repetitive use associated with fitness clubs and rehabilitation professionals. Choose between a mat thickness of .6" or 1" thick, based on your own personal preference. In general, Yoga practice is best with the .6" thickness, while Pilates is best with the 1" thick Exercise Mat. I love the quality of this mat and the thickness. I have fibromyalgia and arthritis. This mat is great! It's more than I could have hoped for. It's lightweight, dense and offers all the protection I needed. Perfect for those of us who need something 'more'. Price point was lower than I had found at other stores and it shipped and was in my home within days. Thank You!! !